@Jipz, not that I'm aware of. I always treated it like a cab. @Duncan5769, my rule for getting in anyone car is back and across if possible. They can see you and you can see them, it's not too awkward and you can't hide anything if you're malicious. I would do the same for cabs and uber if it existed in my town. 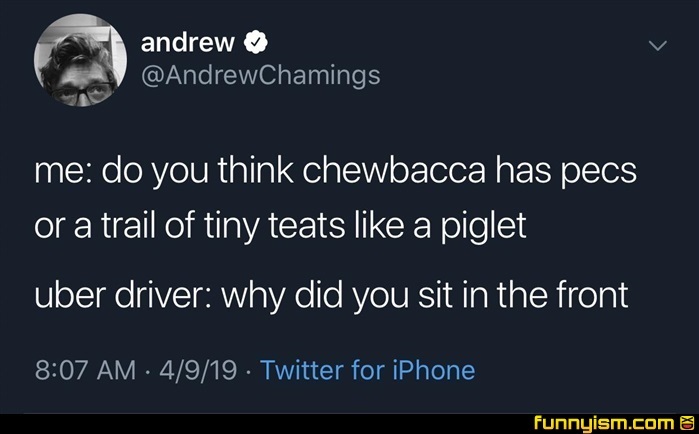 @Duncan5769, I took a LYFT home from the airport last week and without thinking I got in the front seat. It was too late to switch to the back so it was just him and I for 40 mins. Luckily he was a cool dude but that was a risky move. As an Uber driver I prefer people sit in front because I can use my peripheral vision to make sure they aren't doing anything. I'm always paranoid they're gonna rob me or something and not having them behind me is comforting. Also, I've had people try to cut my seats for some reason and luckily I was able to see them and stop them before they did. Those should both be questions.